At photokina 2014, Schedoni, the Italian leather-goods manufacturer from Modena, and Leica Camera AG, Wetzlar, will be presenting the first accessory created in a collaboration between the two companies: a premium leather bag that, thanks to its ingenious design, may be used both as a classic camera bag and as a business bag for discerning owners. Each Schedoni for Leica bag is painstakingly handcrafted from north Italian cowhide saddle leather by highly skilled and experienced leather workers. The production of a single bag using these traditional craft principles takes approximately 18 hours and involves the precise sewing of exactly 112 individual pieces of leather. The cognac-coloured leather is tanned in a traditional, purely organic process. This process is particularly environmentally friendly, as it involves no chemicals or other toxic substances. The inside of the bag is manufactured from selected, lightly sanded nubuck leather and lends the bag its inimitably velvety character. The dividing elements inside the bag can be easily exchanged and flexibly configured to create customised compartments for holding cameras, lenses and other photographic accessories. With these dividing elements removed, the bag is ideal for carrying documents and other business paraphernalia. A special sleeve compartment for a laptop computer and an integrated leather pocket for fountain pens and writing utensils increase the versatility of the bag and make it a perfect and stylish companion for everyday business use. All metal fittings are made of the finest brass, refined by palladium plating. The threads for the eye-catching contrast stitching are sourced from German y. The bag will be available in a strictly limited edition of only 100 units and will bear a discreetly placed edition number on the inside. 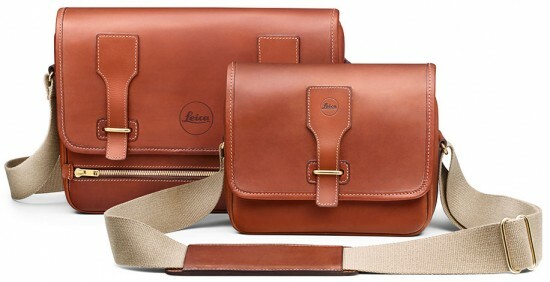 The bag will be available from Leica Stores. Leica and Schedoni will also be offering three matching leather accessories: slipcases for an iPad, an iPhone and for credit and business cards – all handcrafted by Schedoni from the same cowhide saddle and nubuck leather. Through matching design and materials, the bag and accessories create a perfectly harmonised four-part ensemble. The slipcases offer optimum protection for carrying sensitive devices. A practical pull-out mechanism ensures fast and uncomplicated access to the iPhone or iPad. Credit cards and business cards are ideally protected against dirt, rubbing and moisture. The matching premium leather accessories for the Schedoni for Leica bag are an unlimited edition and will be available as individual products from Leica Stores and Leica Boutiques. 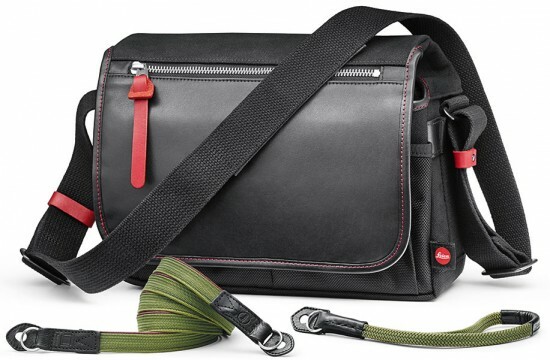 Leica Camera AG, Wetzlar, presents the Aneas Edition for Leica, a premium camera bag in a strictly limited edition. This accessory was produced in collaboration with Aneas, the French artisan workshop well known for their use of the finest leathers and elaborate finishing. The portfolio of this prestigious company embraces an extensive collection of bags of all kinds: for example for travelling, business and hunting. Handcrafted in brown organically tanned leather, the Aneas Edition for Leica is distinguished by its discreet, yet equally elegant, premium design. It also features an ingeniously designed compartment concept for which suggestions provided by photographers were taken into account. Thanks to a cleverly designed sliding wall system, compartments can be customised to meet individual needs. The bag also features a convincingly simple closure concept. The Aneas Edition for Leica is available in the sizes S and M in a limited edition of 500 examples of each. In the smaller, more compact version, the bag offers sufficient space for a Leica camera (M, T or X), up to two lenses and various accessories. A camera, up to three lenses, a flash unit and accessories find ideal stowage space in the larger version. The Aneas Edition for Leica bags will be available from Leica Stores and Boutiques from the end of October 2014. With the Artisan & Artist Edition for Leica, Leica Camera AG, Wetzlar, presents a system bag that unites superior material qualities and finishing in a perfectly designed product concept. Just like Leica, the Japanese manufacturer of premium camera accessories Artisan & Artist has a passion for handcrafted excellence, attention to detail and painstakingly selected materials. The result is a compact and exceptionally high-quality bag that is ideal for short trips and city travel with only the essential camera equipment. 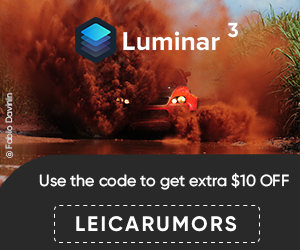 It provides sufficient space for basic camera gear: for instance, for safe and convenient stowage of a Leica M with a lens attached, an alternative lens, batteries and SD cards. The use of the finest leather together with hard-wearing weatherproof nylon in the manufacture of the Artisan & Artist Edition for Leica bag lends it an especially stylish look. Hand-sewn stitching and contrasting elements in red define its classically elegant design. Inside, the bag offers an ingeniously designed soft inlay that offers ideal protection and adaptability. When the inlay is removed, the camera system bag becomes a discreetly elegant shoulder bag for everyday use. The sewn-in inner pocket offers space for carrying additional film, memory cards or a spare battery. A hand strap and a carrying strap in plaited green-brown silk are available separately as optional camera accessories to match the Artisan & Artist Edition for Leica system bag. The elaborate plaiting process makes them exceptionally strong and tear-resistant. Protective tabs for the hand-sewn leather end pieces protect the camera body and prevent scratching. 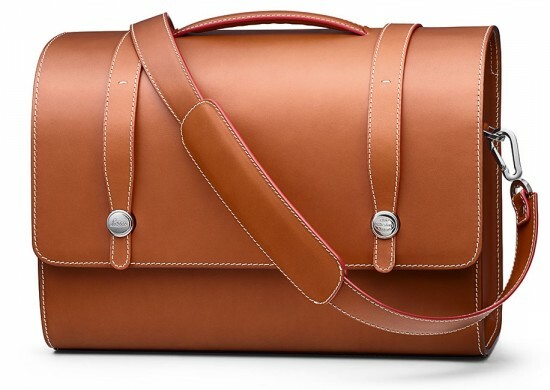 The Artisan & Artist Edition for Leica system bag will be available in Leica Stores and Boutiques from November 2014.